Type: Pair of Nickel-Metal Hydride. Voltage: 1.2 V each. Capacity: 500 mAh. Height: 35.5 mm. Width: 16.6 mm. Depth: 5.8 mm. Construction: Blister pack containing a pair of prismatic cells. 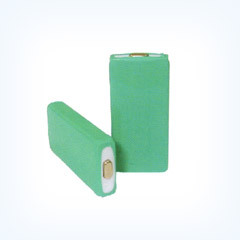 This CP35 NiMH battery fits many Cordless Dect telephones, in particular the SAMSUNG SP-R5210. This CP35 is a replacement for the Energizer CP35-NM and Phonapart NC2043 and NC2043/G and Sanyo HFC1U and the BT02387 rechargeable cordless Dect phone battery. This CP35 consists of two prismatic NiMH cells and fits, amongst others, Samsung SP-R5210, Samsung 5210 Cordless Dect Phones.